Anthony Richards dish - 4⅝" (117 mm) diameter, 1½" (38 mm) high. Anthony Richards, born in Richmond, Surrey in 1924, moved to Cornwall in 1949. He had studied art at Kingston Art School and had developed an interest in pottery. 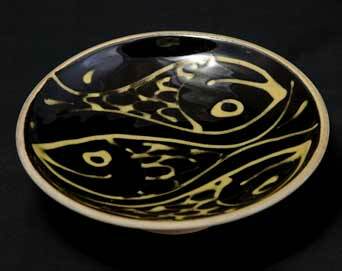 He worked at Lamorna Pottery with Bill Pickard for a while, where he learned to throw and started Penzance Pottery in 1951. He met Christiane, an accomplished decorator, who had recently come to England from her native France in 1954 and married her in 1957. In 1955 he opened Arch Pottery in Hicks Court, off The Digey in St Ives and in 1960 Christiane set up Cellar Pottery in nearby Island Square. After eleven years at The Digey Anthony closed Arch Pottery and he and Christiane moved to Cripplesease on the Penzance Road and set up Penderleath Pottery. At Penderleath Pottery Anthony and Christiane were often hosts to the other potters from the St Ives and Penzance areas and the parties at the Engine Inn, across the road from the pottery, are still spoken of. In 1980 Anthony and Christiane moved to Cockwells, just down from White Cross on the Hayle to Penzance road, and established Countrylane Pottery at No 1, Front Row Cottages. Today they have settled to a routine similar to the one they enjoyed forty years ago in St Ives. Anthony doesn't do so much throwing now, but Christiane decorates terracotta pots glazed and fired by Anthony. Arch Pottery was set up by Anthony Richards at Hicks Court, in The Digey in St Ives in 1955 when he moved from Penzance. John Buchanan learned to pot at Arch, spending five-and-a-half years there from 1961 before leaving to start Anchor Pottery at nearby Hayle. John Bedding also worked at Arch for a short time. Anthony continued making pots in the same way he had at Penzance Pottery, and also threw blanks for his wife, Christiane, to decorate at her Cellar Pottery in Island Square. Arch Pottery continued until 1967 when Anthony bought premises at Cripplesease and founded Penderleath Pottery.